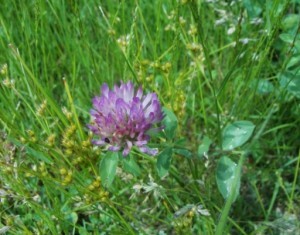 In herbal medicine, Red Clover oil is widely used to treat skin conditions. It may be combined with other purifying herbs such as burdock. Red Clover Oil contains essential vitamins for the skin such as vitamin A, vitamin B-complex. It is also rich in iron. Red Clover Oil contains volatile oil including benzyl alcohol, methyl salicylate, isoflavones, courmarins and cyanogenic glycosides. It is also a rich source of isoflavones. Red clover oil is a wonderful healing plant for skin conditions and is a wonderful herbal remedy for children with skin problems. Red clovers promote healthy skin and are very useful for skin irritations. The oil from the blossoms is a widely used herb for eczema in both adults and safe enough to use on children. Because its ability to promote healthy skin, red clover oil makes a wonderful massage oil . It has calcium and magnesium which tones and relaxes the nervous system, relieving tension due to stress and anxiety. It is easily absorbed into the system. For more information on Red Clover, click here to visit our herbal encyclopedia. 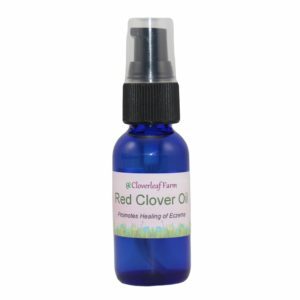 Purchase Cloverleaf Farm’s Organic Red Clover Oil here. 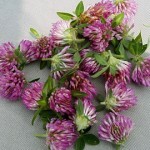 For women, Red Clover Oil is quite special. Research shows that it has phytoestrogenic activity. Phytoestrogens come from plants, and help replace lost estrogen during menopause. Within the last few years, red clover isoflavones have shown to have therapeutic use during menopause. Red Clover Oil helps reduce the falling estrogen levels in the body. It contains stilbene which stimulates estrogen activity, thus helps reduces hot flashes experienced by women during menopause. When applied daily, this beneficial oil may help reduce the symptoms of hot flashes. 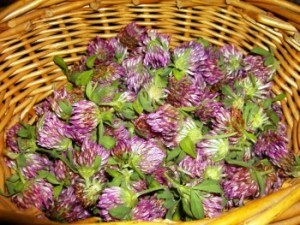 Red Clover Oil bears extensive folk history for curing cancers and tumors. A concentrated oil was applied to a tumor site, which encouraged the tumor to grow outward and thus leave the body. Red Clover Oil may be used as a massage oil in an effort to cure a lump or tumor and is usually combined with other tumor-fighting herbs. Red Clover Oil can be used to treat rheumatism, jaundice, and inflammatory skin conditions. It’s purifying herbal action, makes it a wonderful oil for rashes, such as eczema and psoriasis. For psoriasis, it is usually combined with other herbs. We harvest the flowers by hand each morning after the morning dew has passed. This is when the herbal medicinal qualities are at their highest. The red clover is then sun dried for 8 hours. Sun drying helps retain the beautiful purple color of the red clover blossoms. We then dry the red clover in a herb dehydrator until it is totally dry. We use the cold pressed method of making our Red Clover oil. We take the red clover and steep it in organic sweet almond oil for 8 weeks in a warm sunny window. This method allows the herbal medicinal properties of the herb to be soaked up into the oil, without harming the oil. Red Clover is one of the world’s oldest used herbs. It has an extensive history of recorded benefits and successes. This herbal plant with it’s strong aromatic and medicinal qualities is an advantage to have in any natural medicine cabinet. Learn more about our Red Clover Oil and purchase securely online.